Radishes are most often used as lovely, crunchy salad toppers, but this cool-season, fast-growing vegetable also tastes delicious roasted. 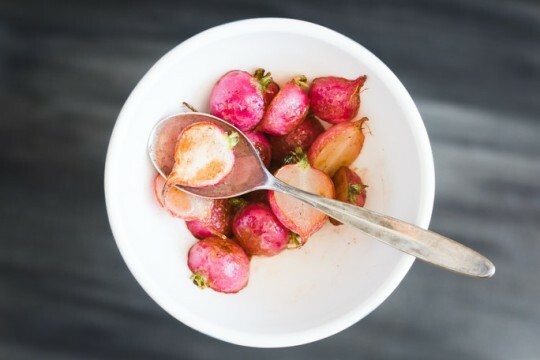 When combined with a refreshing bite of ginger and the tangy flavor of garlic, just a few radishes quickly become a side dish worth talking about. Pair this side dish with your favorite chicken or fish entrée for a full meal. For those who are into Meatless Mondays, try putting these beauties in a tortilla for a crunchy radish taco. 1. Pre-heat oven to 450. Brush large heavy-duty baking sheet with olive oil. 2. Cut off the radish tops, then slice or chop radishes according to preference. Place the radishes in a mixing bowl, add the olive oil, salt, pepper, garlic and ginger and toss thoroughly to coat. 3. Place radishes on prepared baking sheet. Roast until radishes are crisp, stirring occasionally for about 18-20 minutes. Season to taste with coarse salt, if desired.